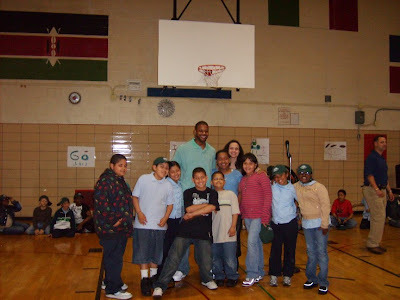 Kerry Rhodes #25 of the NY Jets founded the RHODES Foundation as his way to aid in the educational advancement of students. "Catching With Kids" is the newest initiative that incorporates basic athletic skills, following directions and building self esteem as a way to help build future life skills in younger children. 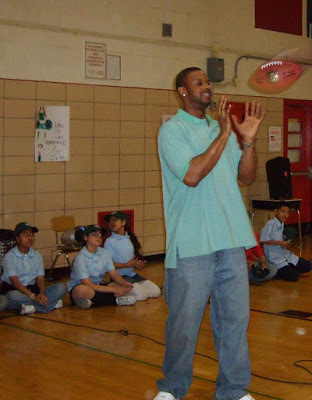 Kerry visited Public School One (PS1) in the Bronx, NY and gave encouraging words and directed all of the kids on how to properly toss a football. While the kids enjoys the Jets hats they were given, a special RHODES #25 Jersey and 2007-2008 NY Jets game tickets, it was Kerry that was the most excited person in the building. Thanks Mario, Tamiko, Amma PS1 and A-Nadyah!